Acadia University Library. Catalogue of books, manuscripts, maps and documents in the William Inglis Morse Collection 1926-1931. Limited edition of 200. 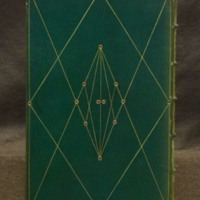 London: The Curwen Press, Plaistow, 1931. vi, I leaf, 85 pages; frontispiece; 23 cm. Edition limited to 200 copies printed on handmade paper at the Curwen Press, Plaistow, London. Main print run bound in a two tone brown printed book cloth over boards with the title, CATALOGUE: MORSE COLLECTION, on the spine. Unknown number of copies bound in commissioned full leather fine bindings by Douglas Cockerell. Cockerell bindings on the title are currently located in the libraries of Yale University and Dalhousie University and the British Library. 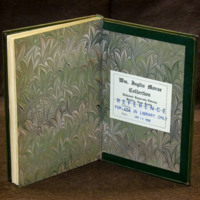 This volume features full medium-green morocco leather binding. The front and back covers are outlined in a single gilt fillet with a red dot inlay at the four corners, single red inlays halfway across the horizontal fillets and another centered halfway down the vertical gilt fillet. Both covers are ornamented with a geometric design composed of single gilt fillets with red dot inlays at the points of convergence. 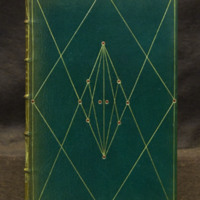 The front and back cover turn-ins are outlined in a single gilt rule along the outermost edges, with two red leather dots inlaid in the outer corners. The inner borders of the leather turn-ins are likewise outlined in a single-blind fillet. Five raised bands create six compartments on the spine. The second and third compartments from the head of the spine contain gilt titling. The first and bottom three compartments are decorated with gilt dots, single gilt fillet borders and intersecting diagonal fillets. Green silk head and tail bands adorn the head and foot of the spine. The top edge of the text is trimmed and in gilt and the other two edges are untrimmed. "D.C. & SON1931" is blind-stamped on the lower left corner of the back cover turn in. The front and back endpapers feature the distinctive Cockerell marbled paper pattern in a combination of green, black and cream inks. The geometric cover design is the most striking feature of the binding. The contrast between the simplicity of the design elements and the complexity of the intricate geometrical pattern is both striking and pleasing as visual balance is achieved. 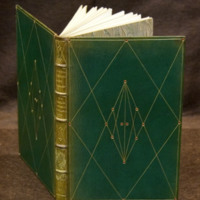 The selection of rich red, green, and gold colours adds to the overall appeal of the binding.